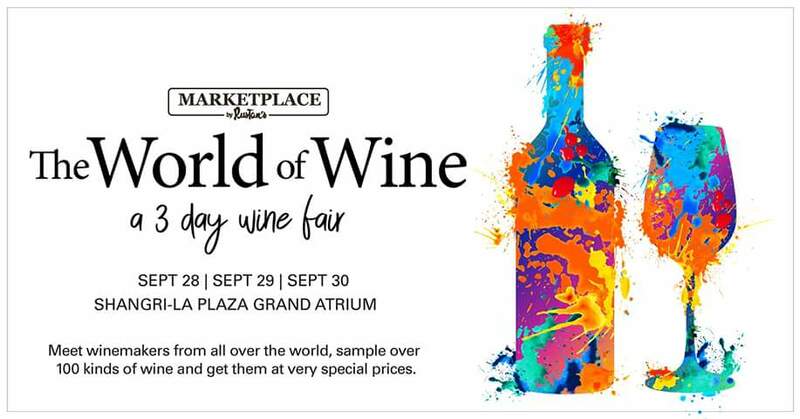 Marketplace by Rustan’s is curating the best in wine under one roof at the World of Wine Fair from September 28 to 30 at the Shangri-La Plaza Grand Atrium. Featuring premium wines sourced directly from estates and sold at exclusive rates, the event boasts selections from 8 different winemaking countries, including Italy, France, USA, Chile, Argentina, and more. Shoppers will also have the special opportunity to learn more about wine culture from 15 of the most respected international winemakers and wine experts in the business. Both aspiring sommeliers and avid wine enthusiasts will be delighted to explore a unique, specially curated selection plucked directly from the wine estate where the wines were produced and stored—an important factor that ensures the wine’s quality, as well as the best price. Among the featured wines are the iconic Torlasco Barbaresco DOCG 2013, the exceptionally rare Château Léoville Las Cases Saint Julien 2010 (rated 98 and 99 by the famous wine critics Robert Parker and James Suckling, respectively), the world-renowned and iconic Terre Di Pozzo Amorone Della Valpoicella DOCG 2014, and several others. 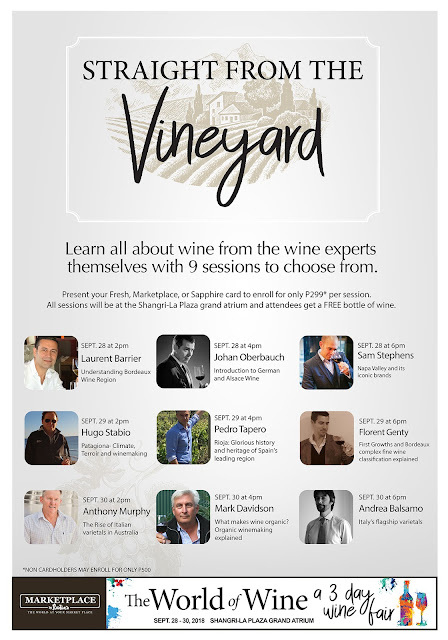 Discover more about wine in Straight from the Vineyard sessions, where 9 renowned winemakers will be discussing topics as varied and stimulating as the history and heritage of the Rioja wine region to the complex wine classification of Bordeaux. To register for a session, simply present your Fresh, Marketplace, or Sapphire card at any Marketplace by Rustan’s branch in Shang, Rockwell or Makati and pay P299 a session. Non-cardholders may enroll for only P500. As a gift, all participants in the sessions will walk home with a free bottle of wine. Don’t miss this chance to sample the best wines from around the world at the World of Wine Festival until October 1 at the Shangri-La Plaza Grand Atrium! You can also continue to enjoy exclusive discounts at the Happy Wine Festival by shopping at any Marketplace by Rustan’s branch from September 28 to October 7.